An innovative model whereby an anti-virus is offered as an online subscription service. The service is available in the form of subscription packages, allowing you to select the anti-virus protection level you need and for how long, taking into consideration your security requirements and current financial situation. Just go into your personal subscriber area at any time to activate a subscription, suspend a subscription (for the duration of a vacation or business trip), expand your Dr.Web protection for new PCs/Macs and mobile devices or decrease the quantity of subscriptions you have, and renew services. 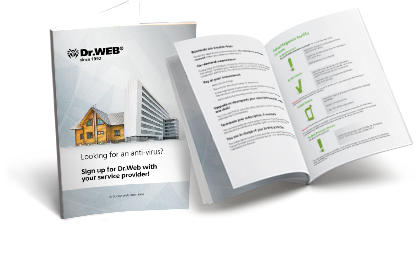 You can also switch packages and get information about how Dr.Web works. If a service user is a company that has a full- or part-time system administrator, its service provider can convey the anti-virus protection system management duties to that individual through the Control Center. This will give the company even greater ability to control the information security of its anti-virus network.